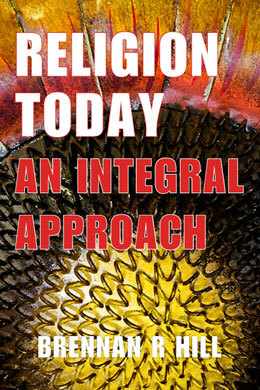 From the phenomenon of individuals becoming “spiritual but not religious” to multiple religions’ views on homosexuality, Religion Today: An Integral Approach integrates multiple perspectives to examine how religion relates to today’s society. Hill shares the thoughts and theories of psychologists, historians, experts on world religions, sociologists, social justice activists, environmentalists, feminists, experts in spirituality, evolutionists and many others in an attempt to provide readers with a more balanced understanding of the world and encourage them to explore their own relationship with religion through both an internal dialogue and discussions with others. Under Hill’s learned guidance, the reader receives a background on the history and basic elements of religion before diving into how religion relates to Ken Wilber’s four quadrants of life: the “I,” the “Thou,” the “We,” and the “It.” From this foundation, Hill then examines the roles of spirituality and faith with regard to religion and investigates the relationship between religion and numerous social issues that are relevant to young adults today. As your introduction to Religion Today, an excerpt is available for you to sample on your iPad/iBook or any other ePub reader. This title can be purchased as an eBook through Apple iTunes, and can be read via the free iBooks app on current Apple iOS and Mac OS X devices. A foundation course prior to the study of World Religions.